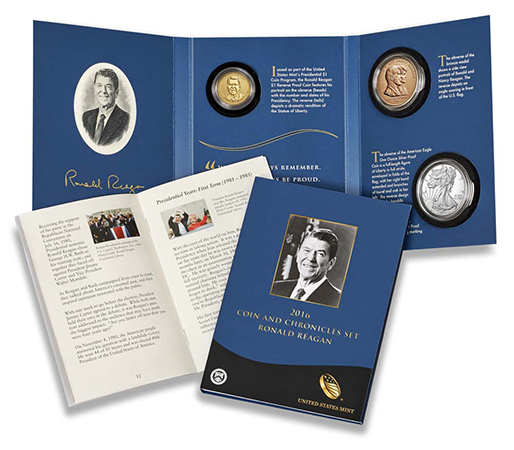 The Ronald Reagan Coin & Chronicles Set—the final in the series—will be available for purchase at noon on October 11, 2016. They are offered by the Mint at $68.95. 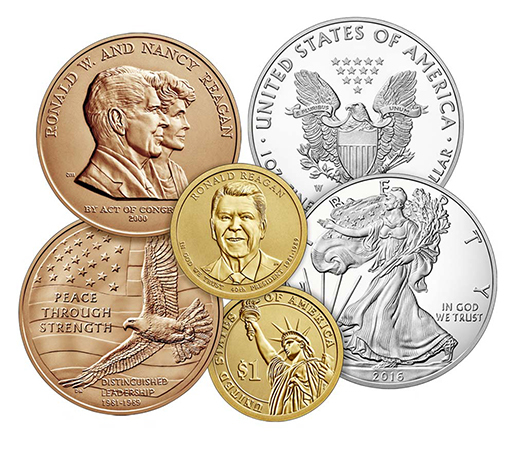 The set contains a 2016-S Presidential Reverse Proof $1 coin, a one-ounce American Silver Eagle Proof coin with West Point (W) mintmark, and a 1-1/2 inch replica of the Congressional Gold Medal depicting President Ronald Reagan and Nancy Reagan. 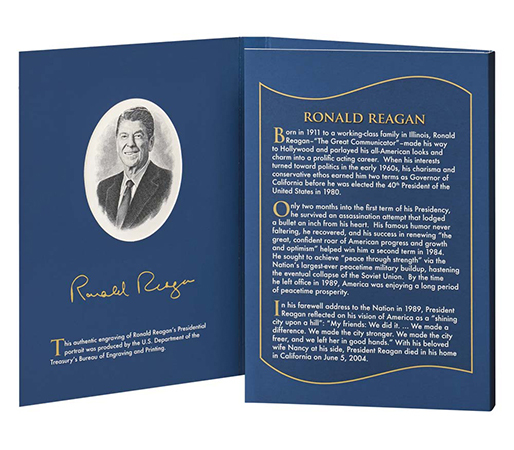 Each item is enclosed in a clear capsule and housed in a blue, trifold folder with an informational booklet and a certificate of authenticity. The number of sets produced is limited to 150,000; the household order limit is 5. To order this and other Mint products, click here. What a missed opportunity on the ASE not to have it minted in San Francisco as they were when the series began during Ronald Reagan administration. Who is in charge of marketing? 150K would not have made it that rare, SAD…………….. The set looks good. I knew there was a reason I didn’t order the Proof ASE on day one. I’ll get a Reagan Set and be done for the year. At least the household limit of 3 brings the mintage to 50k. That could help secondary prices? The mintage is way way to high,i thought the Kennedy was high ,this is crazy.I think the mint just wants to get rid of alot of proof eagle coins. yes, it is a bit strange. First householdlimit was 5, now it is 3. For me the limit is zero. 150000 what for, laying around in stores?